What controls how violently a volcano erupts? Stratovolcanoes like Mount St Helens (USA), Gunung Merapi (Indonesia), or Volcán de Colima (Mexico) tend to erupt in two distinct ways: effusively and/or explosively. Effusive eruptions are eruptions where lava is extruded without any major explosions. Although effusive eruptions can be dangerous, at stratovolcanoes they tend to be restricted to volcanic craters and loss of life and property is relatively limited. On the other hand, explosive eruptions tend to be more catastrophic and can devastate local populations and land. What’s peculiar is that stratovolcanoes often switch their eruptive behaviour between effusive and explosive (sometimes during the same eruption!) and volcanologists aren’t totally sure why. Stratovolcanoes can erupt both explosively and effusively. Mount Sinabung in Indonesia (L) erupting explosively in 2015. Mount St. Helens in the USA (R) in 2006 during a period of effusive eruption. Sinaburg photo credit: SUTANTA ADITYA/AFP. Mount St. Helens photo credit: Willie Scott, USGS. A lot of processes can affect eruption style, but one that volcanologists spend a lot of time thinking about is how gases build up in and are released from the volcanic system. Experimental volcanologists, like me, try to address this problem by conducting scalable lab experiments that help reveal the pathways that gases take to the surface. We try to understand how the permeability of the volcanic system – the ease with which the volcanic system allows gas to move within it – changes over time. 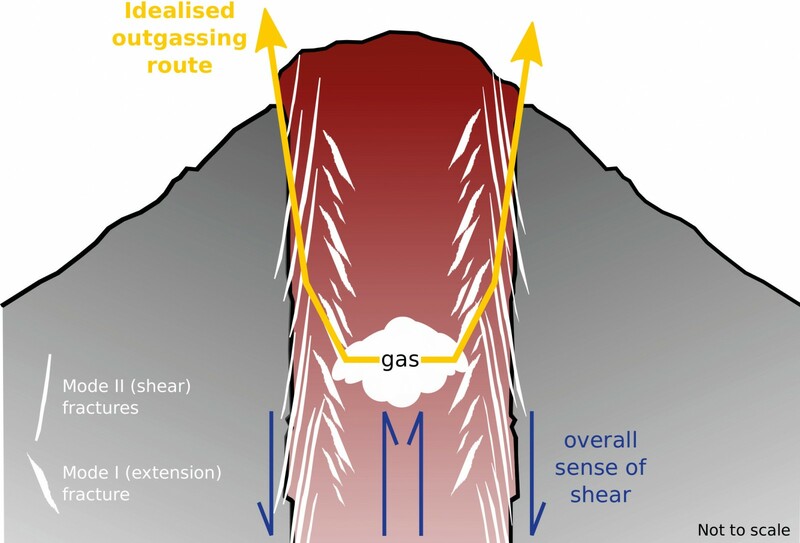 Shear fractures pose a conundrum: they’re not optimally oriented to direct gases accumulating in the centres of volcanic conduits up towards the surface. To understand how magma deformation can produce escape pathways for gas similar to those seen at Santiaguito volcano, we ran a series of laboratory experiments in which we sheared magma at temperature and pressure conditions relevant to volcanic systems. Using a deformation apparatus, we could shear cylindrical samples of a two-phase magma – containing bubbles and melt – by twisting them. Our goal was to see if we could make the samples permeable simply by deforming them in shear. Schematics of our samples before deformation (L) and after deformation (R). The black circles in the starting material are argon bubbles; the white space is the melt. 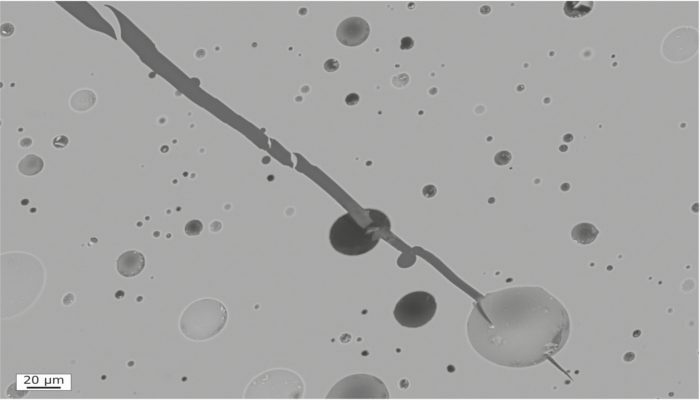 After deformation, the bubbles are stretched in the direction of deformation (as indicated by the red line). 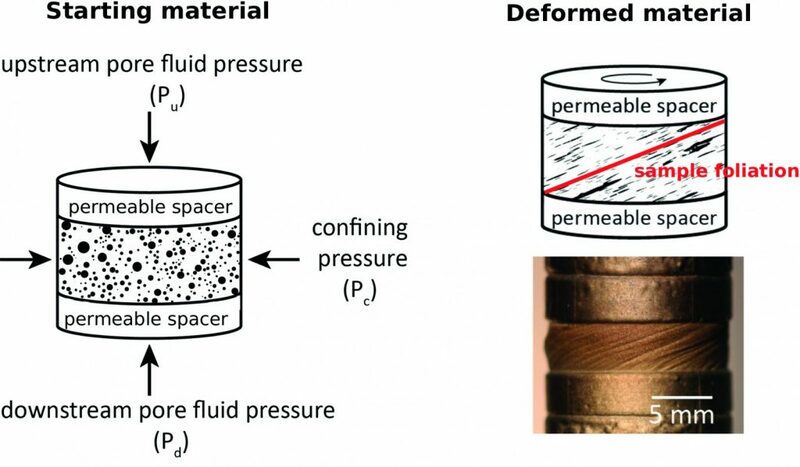 The picture shows a sample after deformation; the entire sample surface is covered by an iron jacket that isolates the pore fluid (inside of the sample) from the confining pressure (outside the sample). Image credit: Alex Kushnir. To keep things simple we used a synthetic glass with a composition comparable to natural volcanic products. We also used argon to create bubbles instead of water (since dissolved water can change the melt viscosity and we wanted to keep this parameter constant!). Most importantly of all: we checked that all our samples were impermeable before deformation. In practice, this meant that no gas could travel from the top of the sample to the bottom of the sample. We found that for samples deformed at low shear strain rates (i.e. low twist rates), the bubbles became very stretched in the direction of shear but never coalesced and, so, the samples never became permeable. For samples deformed quickly (i.e. high twist rates), bubbles became stretched and again did not coalesce. However, at these high twist rates fractures developed perpendicular to the overall foliation! Thus the samples deformed at the high twist rates became permeable. These fractures are well known to structural geologists: Mode I (or extension) fractures. They open in response to a tensile force, which acts to pull the magma apart in the direction of shear. In our study, only samples that were sheared quickly contained these Mode I fractures and became permeable. Scanning Electron Microscope images of the magma deformed at low twist rates (L) and at high twist rates (R). The arrows show the sense of direction (the top of the photos is being moved to the right) and the dotted red line shows the foliation in the samples. The fracture in (R) is oriented at approximately 90° to the overall sample foliation. Photo credit: Alex Kushnir. We confirmed something that volcanologists have known for a long time: when you deform magma slowly, it tends to relax and flow in response to the applied stress. But if you deform that same magma quickly, it tends to break. Idealized (and definitely not to scale!) schematic of shear-induced fractures near conduit margins. Given the general sense of shear at conduit margins when magma rises, Mode II (or shear) fractures are typically oriented approximately parallel to the conduit margins and directed slightly into the conduit. Mode I (or extension) fractures, on the other hand, are oriented such that they can potentially direct gases from near the centre of conduits upwards and outwards to the surface. Image credit: Alex Kushnir. In general, the shear fractures run parallel to the conduit margins, which is great for getting gas out of the system, but not so great for grabbing the gas from the centre of the magma column, where it’s expanding and accumulating. That’s where these handy Mode I fractures might come into play. They’re oriented in an optimal direction for sampling the gas in the interior of the magma column and directing the gas upward and outward toward the conduit margins, where they can join a high permeability highway to the surface. Of course, our samples are tiny compared to a volcano and we aren’t yet able to say how prevalent this process may be. However, our experimental approach shows that you can start to learn a lot about a big problem from a centimeter-scale sample! Blog written by Alex Kushnir. For more information check out the recent paper. Or get in touch with Alex on twitter. Will Hutchison is a postdoctoral researcher at the Department of Earth Sciences (University of St Andrews). He uses a range of geophysical and geochemical techniques to understand the causes and consequences of magmatism and volcanic activity. Will is currently working as part of the HiTech AlkCarb consortium investigating the roof zones of alkaline magmatic systems in Greenland. Welcome to the blog of the Geochemistry, Mineralogy, Petrology & Volcanology (GMPV) Division of the European Geosciences Union (EGU). This blog serves as a platform for the GMPV community to share news, events, and activities, as well as updates on the latest research. All GMPV researchers can contribute to this blog and we are particularly keen to showcase the work of young (early-career) scientists. Please send any blogs, stories or tips to the editor Will Hutchison.